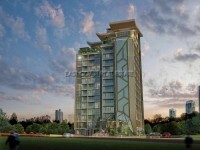 Hyde Park 2 - A lovely low rise condominium is located just off the Thappraya road which is only minutes away from Pattaya City and Jomtien Beach. Being on taxi route, it is very easy getting around via baht buses. You are also based very close to one of the most attracted, best and beautiful view points in whole of Pattaya! This 1 bedroom corner unit consists of up to 59sqm and is offered for sale or rent. It comes fully furnished with fully fitted European kitchen, good size bedroom and bathroom, open lounge and dining areas. Also has a fully sized walkable balcony which spreads round the unit. The building services a lush communal rooftop swimming pool, gymnasium, under covered parking, keycard access, security, CCTV and free building wifi for residents. The title deed is held under a Foreign name and transfer fees are to split 50/50 between both parties. Also available for rent at a minimum of 6 month contract.